For the most part, some dodgy refereeing and public relations aside, the 2010 FIFA World Cup was fairly successful event. However, one feature of the World Cup was an unmitigated failure: The vuvuzela. Now, I'm not writing of the actual vuvuzela. That traditional and noble Zulu instrument is made of an antelope horn and according to Wikipedia is used to signal distant villagers to meetings. One vuvuzela served the important purpose of summoning people for miles around. One. That's plenty. 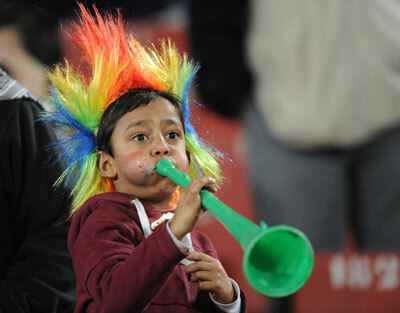 The thousands we heard incessantly throughout the World Cup were cheap, plastic, mass-produced annoyances that had about as much to do with the traditional instrument as a kazoo does with a professional orchestra-class French horn. It's simply a tuneless monstrosity. You can't play anything resembling a melody on it. The only time you'll hear the phrase "that was a smoking vuvuzela" is if some irritated soccer fan sets one on fire. It never let up. Ever. Whenever a crowd threatened to break into a song, or a somewhat obscene team chant (or both), the vuvuzela volume would increase exponentially to snuff the sound of human voices out, the way the Death Star did to Alderran in Star Wars. To quote a Jorge Carlito Viejo poem, the vuvuzela was like the proverbial mime: "He never leave." As much as I love the majesty of the World Cup, I will be glad for the leagues to start up again so we can hear proper crowd noise. The next time we hear the sound of mass tooting at a soccer event, I hope it's just because the pies from the stadium vendors are particularly "beany." *Admittedly, much of this consisted of swearing. ** To which he sensibly replied, "Hey, I nutmegged Homer Simpson!" *** Note that I completely omitted the obvious, "The vuvuzela blows" joke. I'm classy like that. 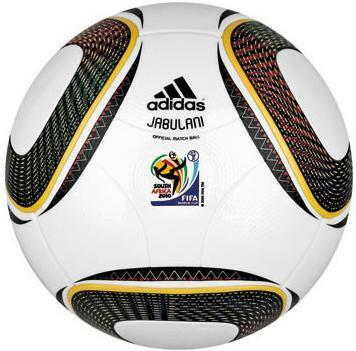 Ah, the Jabulani! No, that's not some South African delicacy that you can find at a quaint little restaurant in Bloemfontein. It's the official ball of the 2010 FIFA World Cup. According to everyone, it was an amazing success... if you consider aerodynamic unpredictablity and universal loathing a success. Forwards and midfielders hated the ball because it didn't fly true on passes and shots, although this also left them with an easy excuse for the shots that wound up in row 57. A shrug of the shoulders and mouth the word "Jabulani." In all honesty, it's better than the excuses with a more consistent ball, which involve covering one's head and bouncing around like Basil Fawlty. Fans hated it because it cost a bajillion dollars and so they had to buy the cheap replica ball that didn't do any of the crazy things the real one did. So, for the cost of $25-40 the only privelege you get is to ostentatiously use the word "Jabulani" in casual conversation on the field. Yes, that NASA. ** NASA, being freed up from shuttle missions and other outer space work, discovered that at speeds exceeding 44 mph the ball's flight becomes very unstable and unpredictable. So, essentially, almost every time the ball is shot by world-class players who regularly hit the ball at 60-plus mph, it's going to do something weird ...just like the Mars Polar Lander. Many people are wondering what the design folks at Adidas were thinking when they produced the Jabulani. I think I have an answer: Jabulani is Zulu for "celebration." Celebrations are happy and fun. Therefore, I have concluded that the Adidas football manufacturers have created the very first "Happy Fun Ball" ever used at a World Cup. Unfortunately for Adidas, no one remembered one of the most important rules about Happy Fun Ball: "Do not taunt Happy Fun Ball." * Or the silly string on Warehouse 13. ** As opposed to the National Aeronautics Soccer Association, not that you'd know.